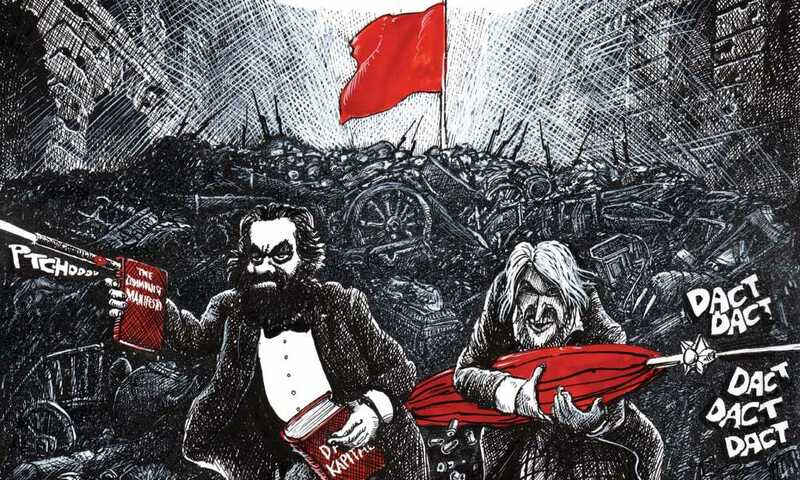 On the 170th anniversary of the publication of Karl Marx’s and Friedrich Engels’ The Communist Manifesto, British graphic novelist Martin Rowson has produced an illustrated adaptation. Apart from a few pages of prose, the whole work is presented in the style of a graphic novel. The preface describes how the middle-aged Rowson became smitten by Marx and Engels' exciting prose when he was only 16. Aside from expressing his great admiration for Marx’s writing, as well as his own critical stance, he furnishes the reader with some historical backdrop to the completion of The Manifesto. Marx had been commissioned to write it by a socialist group in the summer of 1847, but, under pressure, succeeded in producing it at the beginning of 1848. Significantly, that was before the outbreak of revolutionary movements in Europe later on in 1848. Rowson goes on to explain that the initial publication failed to attract the attention of many people. Only after the events of the Paris Commune in 1871 did the pamphlet receive a wide audience and a publication renewal. The illustrations create an atmospheric accompaniment to the Marx figures whose speaking balloons relay the text of The Manifesto. The graphics pair nicely with the text with dense images that impart the feeling of the clashes of historical forces (classes) or with the dramatic rendering of the first lines of The Manifesto in which a spectre appears, so Hamlet-like in two dark and foreboding images to haunt the reader’s mind. There is plenty of theatricality too: images of Marx interacting from a stage with a hostile audience (Rowson’s added flourishes added to enhance the exposition in a stimulating theatrical way). As a literary work, the illustrations do justice to the marvelously compressed, yet sweeping, literary quality of Marx’s verbal imagery and present readers. Though I had read The Manifesto years ago, I found the adaptation to be both a refresher and newly insightful.